I think all of us have been in your shoes one time or another, Nancy. Figuring out what went wrong after the wheels come out isn't helpful in a lot of cases -- sometimes you just have a bad day -- and they just prolong the agony. I'm glad you've decided to put it behind you. Stepping away from racing marathons is a fine decision. What's your next challenge? @Mark B wrote: I think all of us have been in your shoes one time or another, Nancy. Figuring out what went wrong after the wheels come out isn't helpful in a lot of cases -- sometimes you just have a bad day -- and they just prolong the agony. I'm glad you've decided to put it behind you. I don't think I could figure out what happened if I tried so it's kind of futile. I do know that I love being active and if I keep banging my head against the wall trying to get back to Boston I'll probably regret it. I got my finish and I'm going to have to live with that. We're off to Nepal in 10 days and I have a million things to do to make sure that we're ready. Nepal will be a forced break from training, a significant challenge, and time to spend with Marty without the farm and family pulling us in different directions. Marty is a bit apprehensive and not as adventurous as I am when it comes to travel. I appreciate his willingness to go with me...I don't think I'd go by myself. I hope that we both enjoy it and come home ready to get back to business here at home. I am committed to the Half Ironman in Victoria in early June. The group from Madras that was planning on going hasn't fully committed and I think some/most of them may back out. I'm not to worried if they do. Katie has already agreed to go with me as has Michele and her friend. I'm looking forward to it. It will be a nice change of pace and I won't have any time goals at all! Katie and I did have a really nice time in Indianapolis. The park was only 5 minutes past the Expo and the weather was gorgeous on Friday so we headed to the park with plans to just sit outside for a bit. We ended up doing a very short Segway tour which was a blast! And then picked up my packet on the way back to the hotel. The weather was perfect on race day. Cloudy and cool. Katie spent the morning at the zoo while I ran. Katie is a hockey fan and our Segway guide noticed her sweatshirt and mentioned that there was a farm team in Indy. We ended up at an Indy Fuel game on Saturday night! They lost but it was a hoot! Sunday was hot and humid with thunderstorms...glad I didn't have to run in that. We slept in, went to breakfast and headed to Speedway Indoor Karting to race go-karts...it is Indy. I beat Katie on the track but she beat me on the "road race". The kids just laughed at us. Indy was really a fun city and we enjoyed the time together. Unfortunately the thunderstorms got worse and they shut the airport for several hours. Our plane was sitting on the tarmac...full of passengers but unable to unload. We finally got out a couple hours late, missed our connection but were rebooked on the last flight into Central Oregon. We arrived just after mid-night and were welcomed by freezing rain and black ice. Home safely though. I swam for a few minutes today...and spent some time in the hot tub. Legs are still very sore. Walking is quite difficult! I feel better if I don't sit for to long but will keep all my activity at a very easy level. I don't really have a choice. I'm frustrated but I know that I'm making the right decision. I plan to email Dr. Baggish and Dr. Beckerman and let them know how the race went and that I've decided not to try and go back to Boston. Dr. Baggish offered me a bib no matter what my race results were but that's not what I want. It is time to move on. It sounds like you had a great experience at Indy, in spite of your unsatisfying race result. I get how it's a bittersweet time you're going through. Don't force a decision out of disappointment. Give it a little time. Anyway. Nepal! I'm so envious! I hope you and Marty have a great experience there. Take lots of photos. @Mark B wrote: It sounds like you had a great experience at Indy, in spite of your unsatisfying race result. I can't accept a Boston bib without earning it Mark. There are to many runners who worked hard to run a qualifying time and still didn't make the cut. It's not fair to take a bib away from them. I have mixed feelings about charity bibs for runners like Nick who ran a BQ and didn't quite make it but I did support his effort. I don't have a problem with disabled runners getting a break but I don't feel like I fit that into that category. I know the system is set up to provide bibs to runners who are willing to fundraise but I'm not entirely comfortable with that. I won't judge others but I won't buy a Boston bib. I know the system is also set up to provide bibs under special circumstances and again I won't judge but I don't want a sympathy bib. If I ever do go back to Boston I'll earn my bib and if I can't I'll cheer on those who did. I get the end of your marathon career, so doing that is reasonable and will ease the collective BP of the family a few points. One thing you could do are 50K's, non-competitively of course, because when the 50K is part of a 50 mile or longer, the time limit to complete is huge and people walk. Heck, on that 50K this past April, I only ran 10 miles of it. As a flatlander, one thing I don't get is that a flat course didn't help. I guess I would say the same thing on a hilly course. I hope Augie was nice to Fast Freddy while you were gone. Nepal ought to be really fun, but I'd have to have a stronger motivation than I have to execute it. Will Marty have a long enough cord to bring an electric heater? @ounce wrote: I get the end of your marathon career, so doing that is reasonable and will ease the collective BP of the family a few points. One thing you could do are 50K's, non-competitively of course, because when the 50K is part of a 50 mile or longer, the time limit to complete is huge and people walk. Heck, on that 50K this past April, I only ran 10 miles of it. No ultra's for me Doug. I need to go shorter not longer. And Marty isn't comfortable with me going off road especially if cell service is questionable. Relay's aren't a good option for me either. I enjoyed Hood to Coast but I tend to run to fast for my own good in those situations...don't want to let the team down. Flat is tough for me because I train on rolling hills. The ups/downs utilize different muscles and give the others a break. The flat course relied on the same muscles for to long and they just got tired and refused to play any longer. No need for a heater Doug. We're staying in "Tea Houses". I put that in quotes because I read the description. Stone exterior walls, plywood interior walls between bedrooms, but heat in the dining area. The heat is a stove that burns yak dung. Some even have showers...for a price. I've been advised to make sure my bed isn't right up against the exterior wall or it will be very cold...maybe I do need that heater... I guess that calling them tea houses is reasonable as they will have warm tea for us. My legs felt better after some easy aqua jogging yesterday and I wanted to put a few miles on my boots...they are well broken in as they've been to the summit of South Sister, Kilimanjaro, and hiked for three days on the Appalachian Trail but they've been in the closet for a while. Rain and snow were forecast for later today and even though I would have preferred to wait a couple more days I wanted to go before the bad weather hit. It was spitting snow on the drive to the trailhead and it was cold but it was still very pleasant. I picked a trail that I know well and that is popular enough to have other users even in this weather as I went alone...and there is cell service. So I got in 4 miles with 1718' elevation gain/loss. Went up the hill confidently but the legs were pretty weak and wobbly coming back down. They obviously haven't recovered completely yet. I was glad the last two miles were the level miles along the river. I saw deer, ducks, and climbers but no eagles or otter. Boots and new (warmer) trekking pants felt good. My list of things to do before we go keeps getting longer. Every time I cross one thing off I think of two more! No reason to be disappointed, Nancy as you got the monkey off your back. I'm also guessing/believing that you were more than ready to run faster, but often times our minds don't let us, and even though you don't think it had an impact - I'm betting that it did. However, the monkey is now gone and concentrating on other things for now is a good plan. I don't doubt that you will be back. Yes, we have committed to Victoria and I even registered to make sure that I committed. I did take out the race insurance though, as I got my entry fee and flight $$$$ back for the relay and HIM that I could not do this fall due to my foot. Nice to know that a doctor's not works. I have an appointment tomorrow to see where the foot is at and I am hoping for the best. It has felt fine and pain free for weeks but has been "achy" the last couple of days. I am attributing it to the rain and the fact that I have a Doc appt tommorrow morning - lol. Have a fantastic time in Nepal!! Michele \"1L" Keane wrote: No reason to be disappointed, Nancy as you got the monkey off your back. I'm also guessing/believing that you were more than ready to run faster, but often times our minds don't let us, and even though you don't think it had an impact - I'm betting that it did. However, the monkey is now gone and concentrating on other things for now is a good plan. I don't doubt that you will be back. Thanks Michele...I'm not sure I'll ever really know what went wrong but it doesn't really matter. Not thinking that another marathon will be in my future. We'll see what happens. Hope you get good news at your Doc appt. You must be going crazy staying off the foot! Pilates this morning but I skipped aqua jogging because I needed to watch Conner for Natalie. My legs felt pretty good even after my hike yesterday but the few squats and lunges we did today must have been more than they were ready for. I must have really trashed them on race day...it's never taken me this long to recover. This whole thing has been a not so subtle reminder that I tend to do more than I should and that like it or not I'm getting older. Our Pilates/Masters Swim group has become much more friendly. Maybe it's just me...I've always trained solo and never been very social. Anyway the joke at Pilates this morning as I struggled to complete my lunges was that I needed to go trekking in Nepal for a month so that I could rest and recuperate from training. That's bad when my friends think that trekking at 18,000' will be more restful than my daily routine. I guess they know me pretty well. The other funny comment was from Coach Sara. When I mentioned that both my cardiologists were marathon runners and so they understood my circumstances well but that Dr. Beckerman thought that a full marathon was probably more than I should be doing but wasn't worried enough to say no, her reply was a funny look followed by "and so you're going to do a Half Ironman instead?" We both smiled and laughed. I got an email today reminding me that it was time to sign up for the Heart Breaker Half. (Dr. Beckerman's race in Portland). So I did. It's Feb. 11th. I also signed up for Sara's Total Body Conditioning Class that will be twice a week in Jan and Feb. I'm starting to feel human again! I swam Friday but cut all the distances/repeats down so that I did 2/3rds of the workout. It felt pretty good. Times weren't fantastic but much better than I expected. Then Saturday and Sunday I did absolutely no training at all. Spent the weekend getting ready for the trip including some family time. I've still got a lot to do to get ready so I skipped swimming today and worked in the office all morning and then ran trip related errands. Katie came out for lunch with Marty and I today as well. I think the time off has been good although I do feel a bit of guilt/yearning when I walk past my running shoes. Weather in Nepal looks COLD but not stormy. 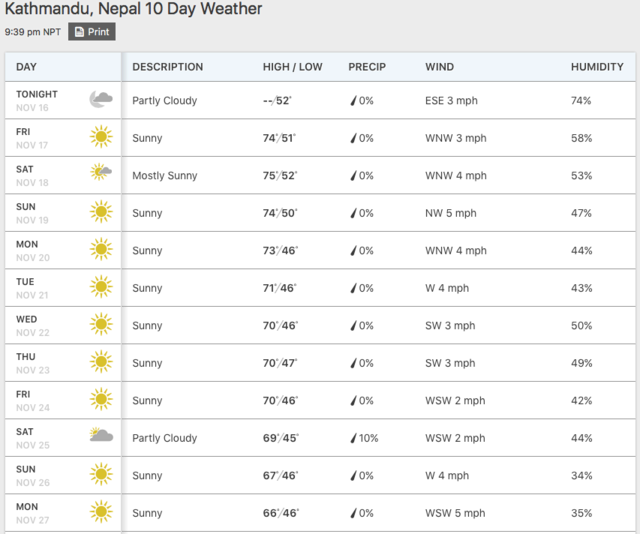 Well, I can't give any special or non-special insight into Nepal weather. Good thing that you don't have too many events planned for next year. I hope your legs recover on the way to Nepal! Enjoy all that snow and trekking. Hope you have have a great adventure! The elevation of Kathmandu is 1,400 meters or 4,600 feet. The bowl-shaped Kathmandu Valley is located at the central of Nepal and is surrounded by four major mountains namely Chandragiri, Nagarjun, Phulchoki, and Shivpuri. It's in a bowl! Well, I hope it gets colder or SOMEbody's going to be pissed. I wonder if she'll have turkey on Thursday? I suspect she's going up into the mountains trekking, and it'll be colder there. Nancy in Nepal wrote: Can't access the blog. Tell Doug Hi. You can follow our progess on http://www.mountainguides.com blog. International Mountain Guides. Everest Marathon is going on right now on the same trail we are on. Hope Fast Freddy resists the urge to join in the race! If he does, he'll become Frozen Freddy. Text update from Nancy in Nepal. We had an absolutely fantastic week trekking in the Khumbu valley. It is a wonderful country and we met some fantastic people including our Sherpa guides. Unfortunately following an enjoyable hike to over 14,600' Marty became quite ill. We both handled the trekking and altitude well. Marty picked up a very nasty strain of the flu which settled in his lungs. They moved us to Kathmandu by helicopter. This will be his 6th night in hospital. His fever returns at night and they won't let him out till he has a better night. So far all the tests are negative for pneumonia. Absolutely enjoyed our week trekking but past ready to go home. Boy, that's some turn! Hopefully, Marty won't get one of those super-bacteria strains, while he's there. It's prudent to keep him in the hospital, until his fever is under 100 for 24 hours. Odd that it comes back at night. Well, he's a hearty soul, which is a big point in his favor. Nancy will be a hearty rock. Very quick update and then I'm headed back to bed. We're home. Marty is fine. He had influenza type A. He spent 8 nights in hospital and wasn't getting better so even though the tests didn't confirm pneumonia his symptoms did so they treated him with IV antibiotics. Not sure if it was time or the meds but he got better. I had a low grade fever and mild flu symptoms during his week in hospital. We had to stay a couple more days before the doctor would release him to fly. We climbed the steps to the monkey temple on our last morning and were both feeling good. My fever spiked on our first flight...to Seoul. They pulled us aside for additional questioning in their health screening and it looked like they might quarantine us. My temp was 38.3. Marty's was fine. After some discussion they let us go...they were looking for Cholera. We had a 12 hour layover and got some much needed rest before resuming our flights. I did fine on the long flight to Seattle but once we arrived home my fever spiked again and I had a pretty miserable night. I got in the see the doctor the next day. I tested negative for influenza. I have an unknown secondary virus/infection. We're assuming I did have the flu in Kathmandu and that I picked up something just before leaving or on the flight. Chances are my immune system was pretty well exhausted by then. I'm on high dose Advil and a prescription decongestant and had a better night. I'm sure I'll be fine in a couple days. Nepal was awesome. The people we met were fantastic. We were hiking in the Khumbu Valley and were a couple days from Everest Base Camp when Marty got sick. Yes, it was COLD. The water on the bathroom floor was frozen! We made it up to just over 14,600' and were both handling the altitude and trekking really well. Darn virus! I'll try and get a couple pictures on here and give you more details once I feel a bit better. Welcome back! Glad you had fun until the bottom fell out. I'm sure the hindquarters of Augie were wiggling faster than his tail, when he saw y'all! Welcome back! It's too bad that your great adventure went sideway due to a stupid virus, but it sounds like you had a great time up to that point. I'm really looking forward to seeing the photos. Once you've rested up a bit, though, of course. Well I took a turn for the worse. After the first 24 hours Advil and Sudafed didn't cut it. I had a fever, massive headache, terrible cough and sore throat. After spending most of Friday night sitting up and trying to breath while my chest felt like I had a knife twisting in it every time I took a deep breath we made another trip to Urgent Care. Pneumonia was confirmed and meds started. Although I still feel pretty miserable at least I was able to breath and get a bit a sleep last night. It may take some time to recover from this! Royce (age 3) asked his Mom why I got sick. He has a rudimentary understanding of germs due to instruction to wash hands etc when the boys are sick. She explained that I got germs from Pappy. He wanted to know how. She said that Pappy probably kissed me. His reply was Eeeeewwww! Bad Pappy! @nkrichards wrote: Well I took a turn for the worse. After the first 24 hours Advil and Sudafed didn't cut it. I had a fever, massive headache, terrible cough and sore throat. After spending most of Friday night sitting up and trying to breath while my chest felt like I had a knife twisting in it every time I took a deep breath we made another trip to Urgent Care. Pneumonia was confirmed and meds started. Although I still feel pretty miserable at least I was able to breath and get a bit a sleep last night. Bad Pappy! Spreading germs like that. What nerve! Sheesh. Boy, those Nepalese bugs had it in for you two, didn't they? I wonder if your time at altitude made you more susceptible than you might otherwise be, but if it was a different breed of bug over there, that could be it, as well. Regardless, yuck! I'm glad you got it diagnosed and are now taking the medication you need. Here's hoping for a speedy recovery -- for both of you! Sorry to hear about Marty in Nepal and you back in in the States - glad you are both on the mend. Kind of a damper into what sounds like a phenomenal experience. Sorry I didn't check in earlier - but we got a bit of snow - yes snow - here in Atlanta and we were without power for a couple of days. All is fine now. Trying to talk an Ohio friend into Victoria - and two more women from Atlanta headed out there. Should be fun!!! Definitely improving but it's not a linear progression...it's been filled with ups and downs. I felt pretty good yesterday so spent some time getting caught up on office work and trying to get things organized and put away. It took it's toll. I laid down at 1:30 for a rest and slept till 5:30 when Marty came in for dinner. Couldn't keep my eyes open so I finally went to bed and slept off/on till 5:30 this morning. Actually pretty happy that I could breathe well enough to sleep that long! As far as figuring out what went wrong I think it's kind of like a marathon. Lots of ideas but we'll never really know. 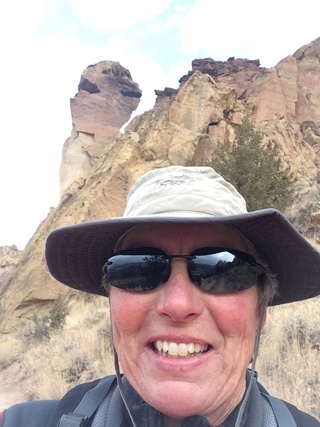 Marty and I were both acclimating very well and handling the challenges of the altitude and the trekking. We were on the trail for a week and had made it to over 14,600'. Marty felt a bit off on Saturday night but we weren't concerned. He deteriorated overnight and it was obvious in the morning that he couldn't continue...or hike down. A helicopter was organized to take us to Kathmandu and we were on board that afternoon. We had been monitoring our oxygen levels throughout the trip and they had been good. Upon arrival at the clinic in Kathmandu he had a headache, fever, low oxygen levels, tested positive for influenza type A, tested positive for a bacterial infection, and was having some lung congestion/wheezing and a cough. They started treatment for the flu, the bacterial infection, put him on oxygen, an IV, and treated his symptoms so he could sleep. When he didn't improve as quickly as expected they did additional tests for pneumonia which all came back negative but they finally treated him anyway and that's when his condition improved. Did he have pneumonia or did his body just finally overcome the influenza? The assumption was that he caught a nasty strain of influenza...they didn't bother to figure out the strain as it wouldn't change the treatment. The assumption was also that it hit him harder than normal because we were at elevation and he has some lung issues due to childhood exposure to smoking both before and after his birth. He's now recovering nicely. My case is a bit more complicated. We flew out of the Khumbu on Sunday and by Tuesday evening I was feeling a bit off. I had very minor flu symptoms but nothing serious enough to warrant testing. I managed my symptoms by taking an Advil before bed and making sure I got 10+ hours of sleep. The rest of the day was spent sitting in the hospital so nothing but rest essentially. A week later when we got the go ahead to fly we were both feeling pretty good. We both had coughs but we climbed the 365 steps to the monkey temple in the morning...slowly. We enjoyed lunch with our Western guide and fellow trekker who had arrived back in Kathmandu. We were tired and coughing but feeling pretty good when we boarded the plane. My fever spiked on the plane. South Korea has a health screening for passengers arriving from certain countries. Nepal was on the list. Since we had a fever and cough within the last 21 days we were pulled aside for screening. Even though my temperature was 38.3 (Marty's was fine) they allowed us to go to our transit accommodation. I learned later that they were on the lookout for Cholera. We rested during our 12 hour layover and I felt pretty good on the long flight to Seattle and the short hop to Redmond. My temperature spiked again that evening so Thursday morning we headed to Urgent Care armed with Marty's medical information. I tested negative for influenza so was told to rest and treat the symptoms. I wasn't tested for pneumonia as I wasn't exhibiting symptoms yet. Friday night was when the breathing issues and chest pain hit. Back to Urgent Care where they tested for pneumonia...positive. They started treatment for both bacterial and viral as those test results wouldn't be available till Monday. On Monday we stopped the treatment for viral. So did I have influenza while in Nepal? I think I may have and that because I was down at 4000' and resting my body was able to handle it. I'm not surprised that I didn't test positive for influenza as the first test was 10 days after the onset of symptoms and it's likely I was recovered by than...but ????? The doctors assumption is that my immune system was compromised by the influenza and then I flew home and was either exposed to something else or just run down enough that something lying dormant for a few days in my body became more active. That's the part where we'll never really know I guess. I have very mixed feelings at this point. We did all the right things and a nasty virus caught up with us. That said...a good portion of the family members who stayed home were/are battling with illness. Is old age catching up with us? Not sure we'll ever really know. Hi Michele...good to hear you're running again. Marty and I are making a slow recovery...it's going to take time. We'll keep in touch concerning Victoria. I'm a bit concerned about my ability to be ready. My immune system is non-existent. I've killed all the good bugs in my digestive system. My tendons are at an increased risk of rupture. I can't walk to the bathroom without struggling for breath. It will take weeks for my cough to go away. That said...I'm coming off my most calendar year mileage ever. Even though I'm still bitterly disappointed in my marathon performance I felt like I would have a good base to start tri training. Now I'm not so sure. I only have 5 months. I'll just have to see how things go in the next few weeks. I'm a bit concerned that if I do plan on participating at Victoria I'll do to much to soon and it won't turn out well. We'll keep in touch as far as the house goes... If I can't go you're welcome to take over the rental...or I can cancel it if you have a better option for you and friends. Even if I do go you're welcome to room with friends if that's a better fit. We'll just have to see how things go. We'll figure out something that works for both of us. I'm glad y'all are well enough to sit up and take nourishment. I'd venture a guess that, with Nepal being unfamiliar territory to y'alls immune systems, a bad actor had easy access to cause turmoil. Nothing you could do. I imagine that Augie fur, while attached, has medicinal properties. And he's warm, too! Royce will also be your cop and protector from that germ factory, Marty! NO sucking face for weeks!